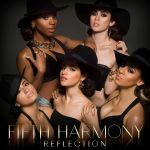 Top Down *** **<br>Bo$$ *** *<br>Sledgehammer *** ***<br>Worth It *** **<br>This Is How We Roll *** **<br>Everlasting Love *** *<br>Like Mariah *** *<br>Them Girls Be Like *** *<br>Reflection ***<br>Suga Mama ***<br>We Know *** *<br>Going Nowhere *** *<br>Body Rock *** *<br>Brave, Honest, Beautiful *** *<br><br>4.21 - 4*<br><br>Ein überraschend gutes Pop/R&B-Album, das besonders zu Beginn mit einigen echt tollen Tracks aufwartet. Die zweite Hälfte schwächelt zwar, aber es ist trotzdem alles auf einem Niveau, das ich so nicht erwartet hätte.<br>Highlights: "Sledgehammer" und "This Is How We Roll"
This is not a bad effort. To me, Fifth Harmony don't have much of an identity and their songs feel like pretty much everything else that is popular at that given time. There are a few on here that I enjoy, and I still think Worth It is a jam (as well as some of the closing tracks) and I'd say I liked this more than I didn't. But at the same time it doesn't really push any buttons or have anything that really stands out. Time will tell if they are able to develop their own niche or not. 4.1/6.